I love, love the scent of the iris flower and more specifically, iris root, so whenever I hear of an iris fragrance, new or old, I run to check it out. I had heard many things about Ferré by Gianfranco Ferré but it was always difficult to find in stores. After a long and rather impatient wait I came face to face with the scent that enrich my life and fill it with all kinds of happiness. This perfume is everything an iris perfume should be. It's transparent, crisp, but at the same time has a sensous depth. When you put it on it envelopes you - I love that. It kind of becomes part or your aura, the perfume-y word for that is sillage. It's so feminine and sweet without being cloying or pink and annoying like so many sweet perfumes are today. The notes are a mix of fruit and flowers, but not done in the boring modern fruity-floral classification of today. No, there is a harmony here and every element works together to make it the kind of scent that can easily be worn every day, or for a romantic dinner, a signature fragrance, the sky's the limit. Just stunning. A keeper. 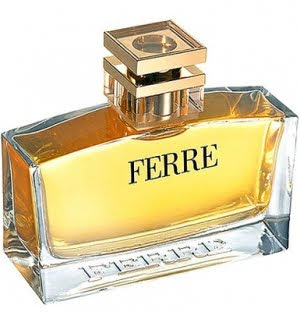 Ferré includes notes of bergamot, iris leaves, honeydew melon, pineapple, freesia, iris petals, jasmine, rose, ylang-ylang, magnolia, basmati rice, Florentine iris root, amber, vanilla.